Conscious Box, another monthly subscription box service, focuses on bringing healthy, eco-friendly items to your doorstep. Their first box came out last November but since they were so new and I already had a bunch, I cancelled. Throughout the year I've still kept my eye on them and finally for their one year anniversary, I decided to subscribe again as a holiday gift to myself. (Maybe I have matured as a monthly box subscriber and decided what is actually of good value (ha)!) So for the November one year box I was pleased with the samples of Justin's peanut butter cups, Freekah, Teecino and pancake mix that I received. It was all food-related but who doesn't like to eat? They remind me a lot of the other subscription box, Love With Food but Conscious Box usually has other random samples.. 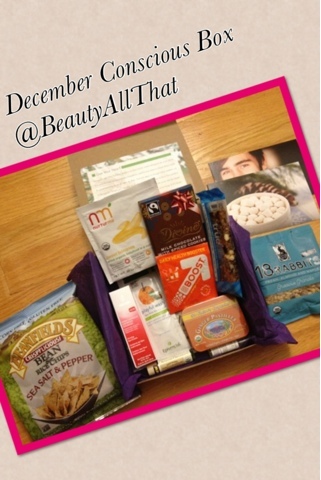 The December box came this week with even more variety- nothing Holiday themed though which is a bummer. Again there's more snacks which I will definitely enjoy during my breaks but my favorite is the Weleda firming eye cream! Valued at $33, the cream makes the whole box worth it! So it's been a fun ride with Conscious Box. It's a new year (and on to trying other boxes perhaps?) 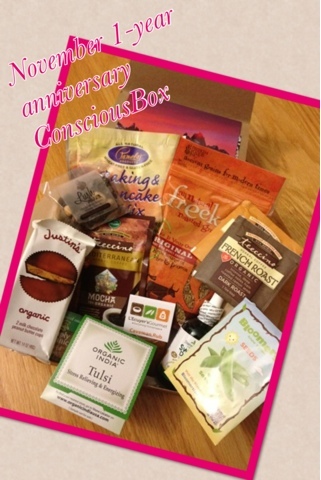 Until next holiday season, Conscious Box! Au revoir! Gifts gifts! Last minute gifts?